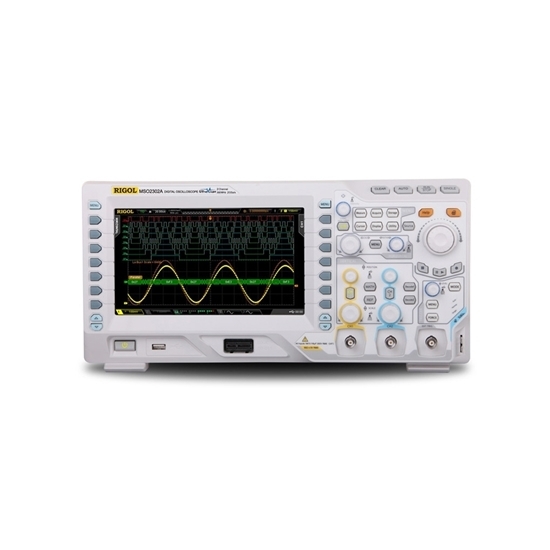 Two channel digital storage oscilloscope with 70 MHz bandwidth and 2 GSa/s sample rate which is designed and produced by Rigol. Up to 256 levels intensity grading waveform display, and wider vertical range is 500uV/div ~ 10V/div, lower noise floor, better for small signal capturing. The trigger of the oscilloscope can enable the signal to be scanned at the correct position point to make the signal characteristic clear. The trigger control button can stabilize the repeated waveform and capture the single waveform. The amplitude of the vertical direction, the transient peak trigger, the over pulse or the short pulse trigger, etc.. The triggering of the time related triggering in the horizontal direction, the pulse width, the narrow pulse, the setting / holding time and other setting time width. The combination ability of the extended and conventional triggering functions, for example, video signal or other difficult to capture. The captured signal is triggered by combination of time and amplitude triggering conditions. The increase of trigger ability can greatly improve the flexibility of the test process and simplify the work, especially the current oscilloscope has greatly improved the trigger ability of the data bus, such as CAN, I2C and so on.